You are here: Home › Analysis › Right-wing extremism › Assad’s far-right Europe corps? ANALYSIS: Should we worry about European right-wing extremists volunteering to fight on Assad’s side in Syria? 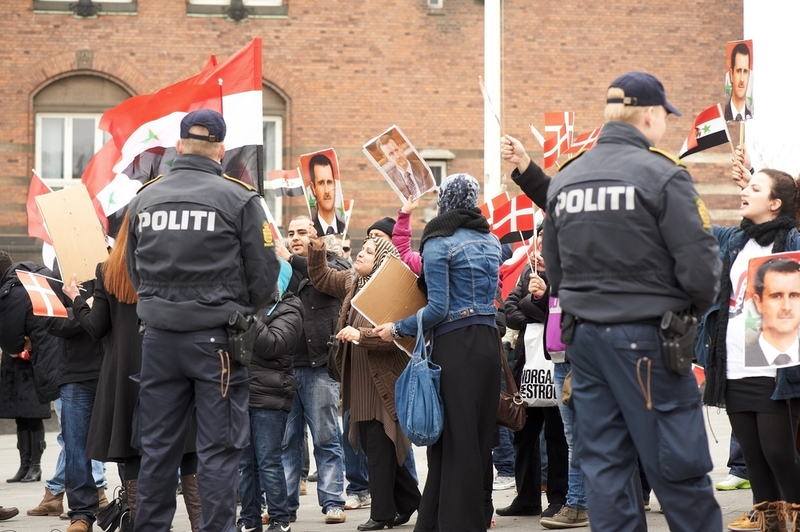 Western intelligence services have repeatedly expressed worry about young Muslim Europeans who travel to Syria to take part in the rebellion against Syrian President Bashar al-Assad and his autocratic Ba’ath-regime. A considerable number of the rebel forces espouse a radical Islamist ideology, some of them have connections to al-Qaeda and intelligence sources express worry that foreign fighters might come back from Syria having radicalized further and acquired military experience. In Belgium, returning volunteers have been suspected of planning terrorist attacks in Belgium itself, and also of having been party to war crimes while fighting on the rebel side. Little attention, however, has been given to right-wing extremist European groups that support Bashar al-Assad, or to the possibility that European volunteers are also fighting on the side of the Assad regime. 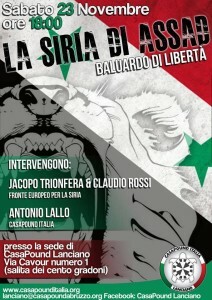 A poster advertising one of several events arranged by the European Solidarity Front for Syria and the neo-fascist group Casa Pound in Italy. In September, the right-wing Greek daily newspaper Dimokratia carried an interview (a translation is found here) with members of the hardline fascist group Mavros Krinos (Black Lily), who claimed that they had people in Syria, “fighting alongside our Syrian brothers in arms […] against an age-old foe”. Stavros Libovisis, a member of the Black Lily editorial group, claimed that Greek fighters had taken part in “all major battles” in the south and west of Syria, and that they had been hailed for their bravery after the al-Qusayr offensive launched by the Syrian government army and Hezbollah in April 2013. In Libovisis’ view, the civil war in Syria is “just another episode in the expanding global dictatorship of the American-Zionist war machine”, and the reasons for the conflict include “the protection of murderous Israeli state interests”. Libovisis was also asked by Dimokratia to estimate the number of European volunteers fighting on Assad’s said. He gave no estimate, but claimed that thousands of Russians, Ukrainians and Poles had declared themselves ready to fight for Assad, whom he called “The Lion of Syria”. This is a rather clear reference to the retired Ukrainian colonel Sergey Razumovsky, who has released a video on the Internet calling for veterans from across the former Soviet Union to join the Syrian civil war, and asking Assad to grant them Syrian citizenship in return. Razumovsky has since claimed – in a statement to the Russian government’s international broadcasting service Voice of Russia – that several thousand people have signed up, “mainly from Russia, Belarus and even Moldova”. Assad’s door has been open to far-right groups for years. In 2005, five years after Bashar had assumed power, American white nationalist and KKK grand wizard David Duke visited Damascus to give a televised speech where he attacked Israel and told the Syrian leader, “Your fight for freedom is the same as our fight for freedom.” The regime was charmed, and clearly happy to play host to an American Holocaust denier who would back their dislike of Israel. Syrian rebel sources, who have their own reasons to keep tabs on foreign support for Assad’s government, have generally focused on Shia militants from Iran and Lebanon, whose participation is certainly easier to substantiate. Yet one rebel blogger, quoted by Whelan, did mention “mercenary military advisers from places such as Russia, Iraq and Eastern Europe”. The infamous pro-jihadist website Kavkaz Center has also posted pictures of documents allegedly belonging to a Russian mercenary working for a Hong Kong-based mercenary company, stating that this is the first evidence that “Russian infidels are taking part in the fighting on the side of Assad”. This led the Russian newspaper Fontanka to carry out further research, including an interview with one of the mercenaries, who confirmed that they had indeed been in Syria, but had left due to problems with their payment. The Russian Federal Security Service, or FSB, has also stated that between 300 and 400 Russian citizens are taking part in the Syrian civil war as soldiers of fortune, and have expressed worry that these people may constitute a security risk when they return. It was not specified which side they were fighting on, but it is known that Chechen volunteers are fighting on the side of the rebels. The presence of soldiers of fortune in Syria would hardly be a surprise. As for European right-wing extremists fighting on Assad’s side, we are left with little else than the claims of Mavros Krinos, whose members allege that a number of Greeks – equivalent to a platoon, i.e. dozens of people – are fighting with pro-Assad forces in Syria, and that they are motivated by ideology, rather than by a chance to earn money. [S]upport by all means the patriotic forces of Syria and understand that they have to ready themselves for the incoming storm that is approaching towards them fast because of the plans of the local Zionist occupation government back home. In an email exchange with Whelan, a Mavros Krinos spokesperson using a pseudonym says that the group is connected with a network called the European Solidarity Front for Syria (ESFS). On their blog, the Greek neo-fascists also report on the network, and on the visit of an ESFS delegation to Damascus, where – according to the report – delegation members met with the Syrian prime minister, Wael Nader al-Haiqi. The ESFS, which claims branches in a number of European and several Latin American countries, has been particularly active in Italy. 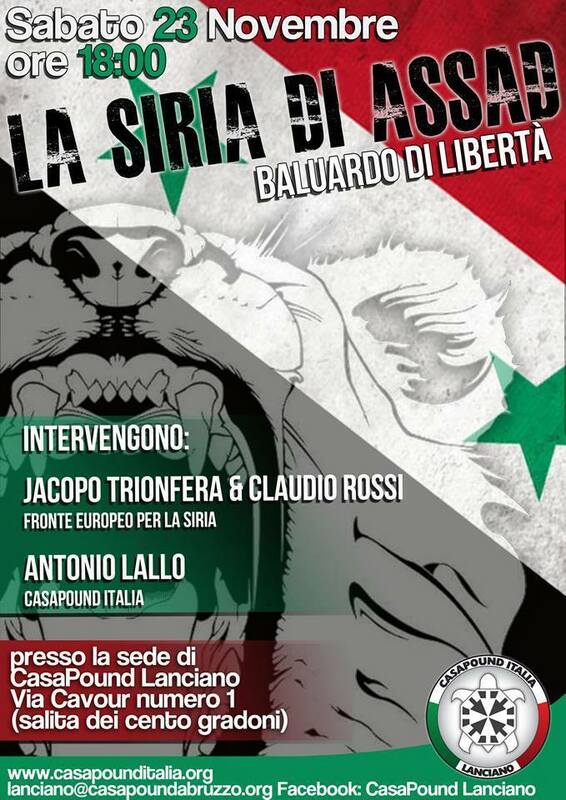 There, members have cooperated closely with the neo-fascist street organization Casa Pound – named after the American poet and fascist Ezra Pound – and with Casa Pound’s student organization, Blocco Studentesco. Their Italian spokesperson, Matteo Caponetti, belongs to the Associazone Culturale Zenit, a “cultural” organization which openly admits its connection to fascism. It is worth noting, however, that the ESFS often employs the language of the radical left, echoing some neo-fascist movements of the late 1960s and 1970s, whose language and style were partly inspired by the 1960s counterculture. Another noteworthy point: It is fully possible to find similarly grounded support for Assad’s regime amongst fringe left-wing movements, and amongst the European Marxist left. Les extremes, se touchent, as the French say. Are there fascist volunteers fighting on Assad’s side? Time will show. There is in any case a certain precedent for such wartime adventurism. Both Greek and Russian volunteers fought on the rebel Serb side in the Bosnian war. According to the New York Times, some of the Greek volunteers were members of the right-wing extremist group Chrysi Avgi (Golden Dawn), which has since received much attention. On the Croatian side, too, right-wing extremists from other European countries took part. If it is indeed the case that right-wing extremists are present in Syria, intelligence services and others have reason to worry. The accidental discovery of a possible right-wing extremist group in Germany sheds some light on the potential: In March 2012, a man was found dead in a guesthouse in the village Herzberg, some 60 km northwest of Berlin. The man, identified as Jörg Lange, had died of a heart attack. However, in his room, the police found a military backpack containing three guns – including a modified American-made submachine gun – and 300 cartridges of ammunition. 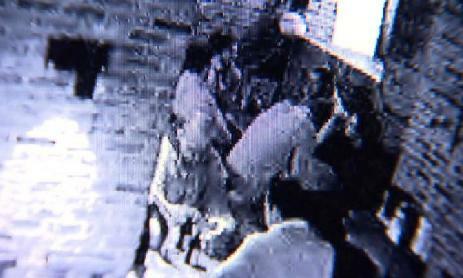 Investigations showed that he was in the process of setting up a training centre. An obituary in an extremist publication noted that Lange had fought as a volunteer in the Yugoslav wars, on the Croatian side, and that his death was a severe “organizational and political” setback for the training centre project. It is unclear whether Lange’s experience from the Balkans played any role in his subsequent militant activities. What is clear is that fledgling jihadists are not the only young Europeans capable of picking up military experience and further radicalization in foreign wars. One Response to Assad’s far-right Europe corps? Assad still has not divulged the wherabouts or grave of Alois Brunner. What’s holidng him up?